We had run out of duct tape today, so E! went and got some at Lowe's. She came back waving a coupon. I told you before, we live for this stuff. It seems like Lowe's has this promotion again, where when you buy something your receipt contains a coupon for $10 off your next purchase of $50 or more. So I put together a shopping list of the things we would get anyway, today, tomorrow, or maybe in a month. Then I headed for Lowe's bought stuff for a little over $50, got my new coupon, went right back in, bought more stuff for a little over $50. Well, you get the idea. It sounds somewhat pathetic to go through this effort, and in the grand scheme of things the savings dwarf in comparison to the amount we invest into Gunk Haus, but it feels good, and with a project of this magnitude we take every little highlight we can get. We did a little more drywalling today, and I hung one of the radiators, just to see how it feels. I think tomorrow we'll use up whatever drywall we have (we only bought enough sheets to do the outside wall of the beer hall, so I could hang the radiators), and then I'll start getting some heat into the beer hall. More drywalling today. It's really starting to look more finished, which really helps with our motivation. It's nice to get a sense of the end of the tunnel, though I don't want to talk about seeing it yet. We played with different stains and wood pieces today, to give us a sense as to how we would like the ceiling to look like. The one we like best so far is the one on the upper left in the picture below. The one in the upper right we'll most likely use to box out the big beams in the beer hall. When you set out on an endeavor like ours, you have to make sure to reward yourself for all the hard work you did. Sometimes that reward can be more work. Sounds crazy? 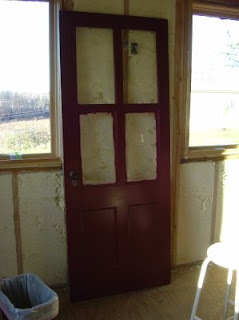 Lately we have done a lot of little stuff, like caulking, small paint jobs, weather proofing, in other words nothing exciting, which is also why I haven't posted many pictures. 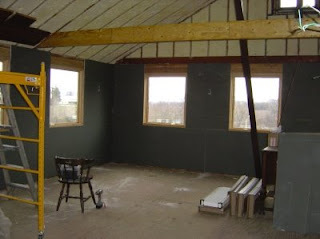 Actually it is blue board (though it looks more gray than blue), which is intended for plastering. We had always wanted to have plaster on the walls instead of simply painting them, because it gives the walls more depth and a warmer look. Frugal as we are and out of necessity we constantly check the various online advertising and auction outlets, namely Craig's List and eBay, for equipment, material, and odds and ends. 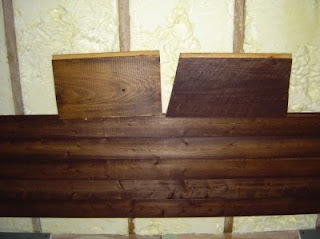 Yesterday I saw an ad for 1000 square feet of salvaged red oak flooring for a whopping $500.00. This is exactly what we need, as half the beer hall still needs flooring. So we went there today to look at the material. 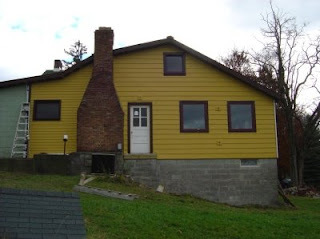 Well, he had already sold 400 sq ft, but we could have done with the remaining 600 sq ft. According to elementary level math 600 sq ft should have cost $300.00. Not in this case, the seller suddenly wanted $400.00. That is when we started struggling. The lot consisted of many shorter pieces, there were still lots of nails in the wood, and it had varying color finishes. We walked away from it, the seller quickly offered $350.00, but the ship had sailed. We are frugal, and we look for deals like this, but we also try to avoid being pound foolish. While the cost may have been lower than buying new, we would have incurred additional cost for sanding, and spent a lot more time installing the floor. Today was also the day we finally received our first shipment of radiators. There shall be heat!!! 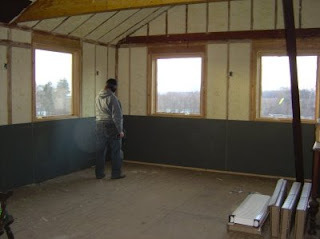 We also picked up a few sheets of blueboard (drywall for plastering) yesterday. So look forward to some visual changes in the beer hall soon. 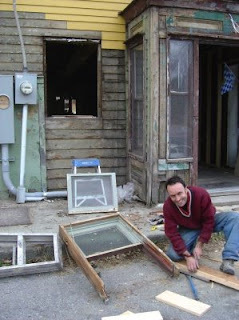 You could argue that our life is boring and monotonous, we get up in the morning, we have breakfast, we fix windows (well, E! is), and that's it. This at least is how our last few days have felt. Today didn't start out any different. Our routine was interrupted twice. Our neighbor Larry stopped by, asking whether he could have some heavy equipment delivered to our parking lot instead of his gravel driveway. How could we say no, we lust for heavy equipment, and we miss AL. The second visitor was somewhat surprising, it was a representative of the health department. This isn't unusual in the sense that we wouldn't expect the health department to show, but at the present stage of Gunk Haus we usually know they are coming, largely because we invite them. This was different. It was a field officer who wanted to check up on the status of our place. The last (written) record shows the transfer of the former Hollywood Bar to some new owner (= us). I wasn't there for the entire conversation, but when I joined the location of our grease trap was already questioned (remember the ditch I excavated for the grease trap), the layout of the dish station didn't seem up to snuff anymore, and in general we got a different vibe as before. 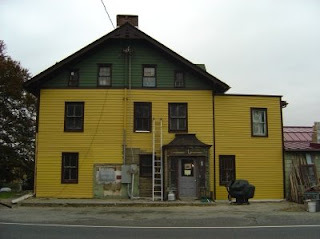 Here is the thing, shortly after we bought Gunk Haus, we went to the health department to have them come by and talk us through as to what they would like to see in a our restaurant, what was important to them. Well, that didn't completely go as planned. We quickly learned that there seem to be different voices, telling you different things, and you have to figure out what is actually important and what is being said because it needs to be said. We did manage to get the health department to visit us, and we did talk and we were told things. 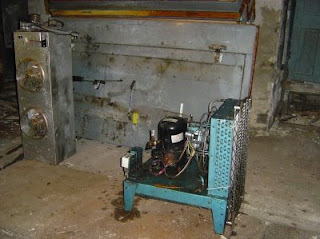 Today, we were told different things, that is after we bought a grease trap and dug a hole in the dish station. My beef with it is not what the rules and regulations are, what I care about is that I know what they are, and not being told one thing on one day and another the next day. I am not trying to get away with something, but what I need is clarity. Life can be frustrating, but I bet you already knew that. We installed a sample of ceiling cover in the beer hall today (sorry, no pictures, I forgot to take them before it got dark). 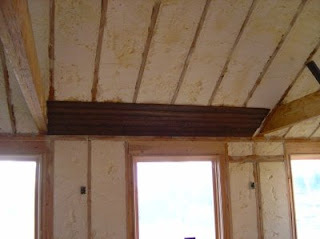 Early on we had decided to cover the ceiling with wood. It will give the room a warmer feel. After five minutes of installation, we looked at the sample and started weighing pros and cons of the particular sample, the type of ceiling cover in general, and, and, and. One of the reasons why we do most of the work ourselves is, because we continuously change our mind, often mid-stream, about how to go about things. 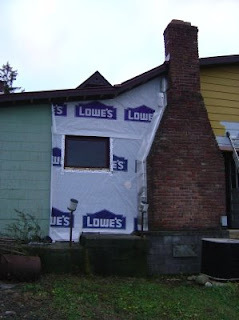 This is largely, because we are not professionals in the field of home improvement. Although we have a vision, we often lack the knowledge of available materials. We can't afford hordes of highly paid professionals, and therefore, we improve the place through trial and error. In our defense, though, even the hordes of professionals will not help you make up your mind. 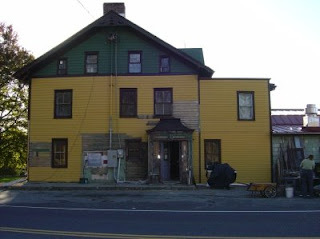 Our problem in this regard is, that we like to make Gunk Haus a great looking place, but we get stuck on so many details a customer most likely won't recognize. What we have been good at so far, however, is to compromise in the end, and recognize what is important and what isn't. It was a slow day today, and so was yesterday, and pretty much the whole last week. I blame largely the cold weather. For the last week we have been experiencing temperatures normal to January or February. That makes you want to cuddle up in bed and wait until Spring. Well, we don't have that luxury. So what gets usout of bed in the morning? The reasons are many, but one is essential, the support of the community. I wrote a post a while back regarding community support, but I want to reiterate this topic. 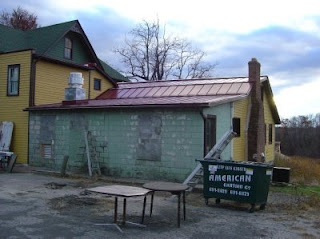 When we bought Gunk Haus we were told that Clintondale is a tight-knit community. What we weren't told is, that it is filled with nice people. How many of your neighbors brought you cookies when you moved to your home? Every other person who drives by Gunk Haus honks, waves, gives us the thumbs-up, yells out of the window how fantastic it looks, or stops to introduce themselves. Yesterday we went to the Clintondale Christian Friends' annual Thanksgiving Community Dinner (the church borders our property), where we met familiar and new faces. As often in these environments, as soon as we introduce ourselves, people get all enthusiastic and give us the verbal pat on the shoulder. More often, though, people already recongize us, because they drive by Gunk Haus all the time. Why is this all important? It gives us confidence that we made the right choice. Jerry was right, cutting glass is for the birds. I was helping E! today, cutting glass for the window sashes she is overhauling. Six of the potentially nine panes I broke. Life can be frustrating. 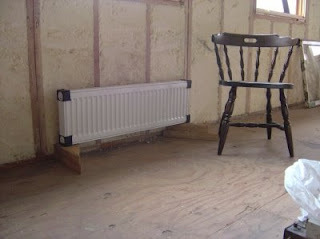 Speaking of, yesterday we received a call from a supplier, where we had ordered the radiators for the beer hall. We were supposed to get them some time around now. Apparently there was a rush in orders just before mine, and now I will only get half the radiators and the other half maybe in January. Did I mention that it is cold right now? E! and I talked future today, no, not about what to do with all the millions we don't have, but what project to tackle next. Granted, this is all subject to change, but we will most likely start dry walling the beer hall soon, and cover up the beer hall ceiling, and yes, install half the radiators. 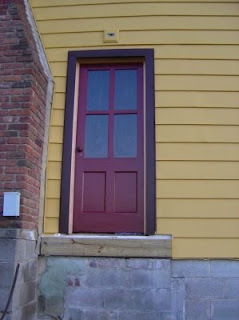 Currently the door goes nowhere, but I will add a stair on the outside, sometime. More window work today. E! 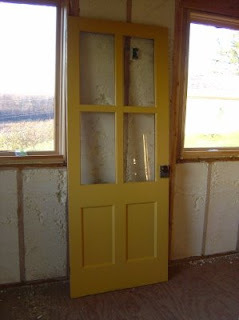 is busy fixing and painting all the window sashes. Some have broken glass, which need replacing. Frugal as we are, we had started collecting old windows over the last year, glass is expensive in case you didn't know. So I got out the glass cutter and started scratching away. I had tried it before and wasn't very successful at it. And it wasn't any different this time around. On the first one I slipped and it broke in a curve, the second one chipped while I tried to brake it off. So we called our personal Dr. Phil, knowledgeable at anything, or at least with an opinion about it (hey Jerry, thanks for all your help). Well, the man had something to say, and advise to spare, but nothing that would make my stupid glass cutter work. Frustration galore! After a few minutes of research on the internet (what did we do before it), I figured I should try a different glass cutter. Off to the next hardware store, money on the counter, glass cutter in hand. At last we got to play with our new toy today. As I mentioned before, we want to stucco the cinder block wall around the kitchen and dish station. 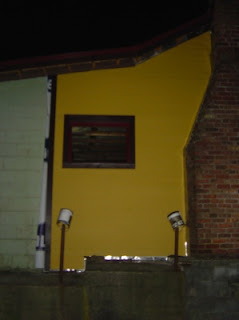 Unfortunately, it had been painted and would therefore not be very conducive to stuccoing, which is why we need to install metal lath, so that the stucco has something to hold on to. The metal lath itself has to be affixed to the cinder block wall, which is where our new toy comes in: A Remington 479 Powder Actuated Tool, in other words a nail gun, the emphasis is on gun. Some of you may remember my email a few months back, asking whether you had any unused coupons for the two big home improvement chains (I don't want to name any names, like Lowe's or Home Depot ... d'oh!). Anyhow, I received a letter yesterday with just such a coupon in it (thank you, Selen), and went shopping today. The savings due to the coupon were the equivalent of a very nice dinner. Now, some of you may think that this isn't a lot, and you might be right. In the grand scheme of things, you save most money by shopping around, but that is only half the story. But we do buy a lot of materials, and these things do add up. I am certain I could get a lot of things cheaper by driving half an hour in any direction to the smaller building suppliers, and we do go the distance for certain materials. However, Lowe's is just two miles down the road from us, and we do buy a lot of little things, odds and ends, which you don't want to spend half a day on calling around, just to save 50 cents, total. So, if you have coupons to spare, send them our way. They will be highly appreciated. Ok, so you don't share my excitement, possibly because you can't figure out what I'm so excited about. 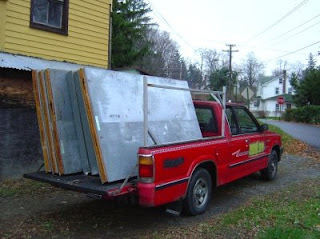 These panels on our trusty pick up truck (I meant to say rusty, but it has been good to us, for the most part) are for a walk-in cooler (Kühlraum). It is six by eight feet, which is smaller than we were looking for, but we got it for a good price, and it will get us through the door. 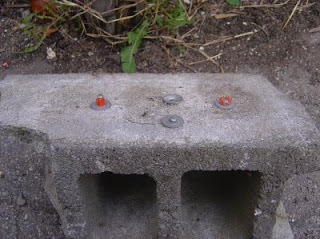 As it was raining most of the day, we bagged the idea of working and went to buy some metal lath for stuccoing (verputzen) the east side cinder block wall. At the building supply store we found a new toy for E!. You'll have to wait until Saturday though to see it in action. Stay tuned. In broad daylight the north side looks very nice. There's a little bit of touch up left, but don't you think it looks fantastic? Today we had the dumpster emptied and moved to the parking lot side. Now the front of the house looks much cleaner already. 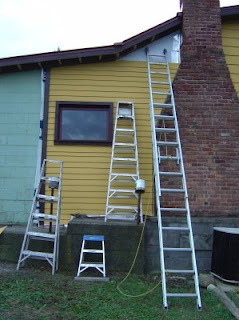 We are going to stucco the cinder block wall, which will be our next project, before it gets really cold. The other day, E! and I went for dinner to a swanky restaurant in New Paltz for E! 's special day (courtesy of E! 's sister and husband, thank you very much). The food was yummy, but ever since we started on our restaurant voyage, I have sharpened my senses with respect to the on goings in a restaurant, the food, the ambiance, the staff. I owe this mostly to E!, she is the chef and business woman. Anyhow, so we sat there and the appetizer rolls in, steak tartar, which was really yummy, except that it had fallen prey to the squeeze bottle. The squeeze bottle is something Anthony Bourdain had already complained about in his book Kitchen Confidential. It allows the cook to decorate a plate with all sorts of sauces, potentially creating a piece of visual art, the emphasis is on visual. The problem is though, that this visual dressing up can ruin the taste of the dish. The steak tartar was squeezed over in stripes with some sauce, making it impossible to get a piece without sauce. It was also fascinating that they used thick brown paper as table cloth. Granted, it was neatly cut, but I didn't get why they put it on in the first place, because they took it off before dessert. Eating out for us is a great exercise in how to run, or not to run our own restaurant. I hope we remember all that once we're open. The biggest problem in the restaurant business are customers who walk out the door never to come back, because they were dissatisfied with food or service. Today I was reminded of another problem restaurants face: Food walking out the door. However, I am not talking about doggy bags or carry out, I am talking about food that never made it in front of the customer. Food theft by employees is not uncommon in restaurants, and it is certainly something we'll have to have an eye on. At the same time, you must be careful not to alienate your employees by a system that would make airport security look childish. More painting today. I know that sounds boring, but you'll have to suffer with us. E! will throw a big party on the day when she can finally pack away the paint brushes. 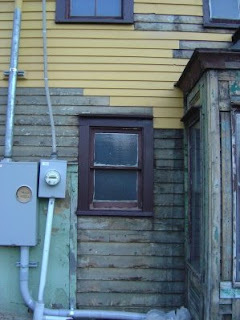 I, meanwhile, prepared a portion of the north side for the installation of new clapboard. After that, you guessed it, there will be more painting. Ok, today something really challenging, so I can find out if you are actually paying attention. Below you find two find images of the house front, the first taken last Friday, and the second taken today. Now, how many differences do you see? Please spare me with such lame answers like "Er, there is a ladder in the one picture. ", or "The sky looks more blue on Friday." Also, don't just say "Well, more stuff has been painted." Window work today. 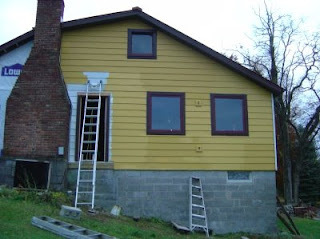 The window next to entrance needed a new outside trim, and a new sill. Nothing easier than that. Well, it is never as easy as it looks, and things never work the way they should. After I reinstalled the window, I realized that I should have made a cut a little deeper. Too late! It just looks a little crooked. Hey, it ain't called the Gunk Haus for nothing. E! was back at painting, which she is sooo getting tired of, but we're down to the nitty gritty parts, and maybe by the end of this week we'll kick the paint bucket to the curb.